Krishna’s last teachings include instructions on small adjustments we can make in our lives to produce practical and profound benefits. The Uddhava Gita, also called the “Last Teaching of Krishna,” contains extensive practical instructions on life including teachings not contained in the more widely known Bhagavad Gita. 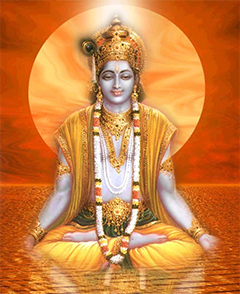 The Uddhava Gita is a portion of the Shrimad Bhagavatam scripture. This mantra and knowledge immersion workshop makes understandable the many ways that Krishna’s teachings to his friend Uddhava can be applied to all of life’s challenges. Includes detailed handout and recording of all workshop mantras. Note: This workshop provides 7 CE Credits per Yoga Alliance. Call the Ananda Ashram office to register. Please see Workshop Registration page.